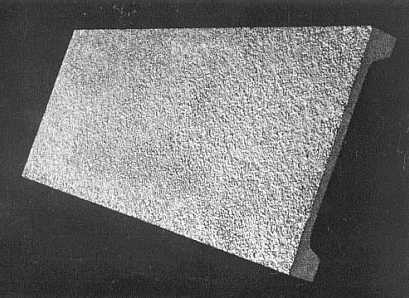 Metal-edge tounge & groove plank is a lightweight (12 psf) precast concrete plank produced in a standard 1'-6"x10'x2" size with a cold-rolled 22 ga. galvanized metal edging. For extreme environmental conditions, stainless steel edging is available. The plank's T&G design and lightweight characteristic (180 lbs/plank) make handling and installation easy on steel, masonry, or wood framing. Support spacing can vary, providing for multiple span schemes. Interlocking edges need not end on supports. Ideal for retrofit work, mezzanines, and new floors within existing structures. It can also provide an instant concrete walkway when used in interstitial floors or catwalk systems. It's nailable and a suitable substrate for shingles or clay tiles on pitched or mansard roofs. Noncombustible and fire-resistant. Contact MidCon Products Inc. for recommendations. Please click on the links below for more information on 2" meta-edge tongue and groove plank. Channel slabs provide a dense, lightweight, fire-resistant, reinforced roof deck system that offer economic and structural advantages. Galvanized reinforcing mesh, dense concrete, and a smooth finish makes the channel slab ideal for moist environments. The installed roof slabs result in an attractive, low- maintenance ceiling requiring no additional finshing. Contact MidCon for recommendations. Please click on the links below for more information on 2 3/4", 3 3/4", & 4 3/4" channel slabs.